Amla Rice , Usirikaya Pulihora , Vanabhojanaalu and Health !! Amla is Indian Gooseberry. This fruit is one of the richest sources of Vitamin C. This Vitamin increases immunity in the body, thereby protecting the body from infections. There are several medicinal properties of Amla. I always knew this fact but didn’t know how to incorporate fresh/raw Amla in my diet. The only knew that people usually ate Amla is in the form of Amla pickle and Amla candy. These two recipes ensure that Amla can be preserved and hence can be relished throughout the year. Amla is a major ingredient in Chyawanprash. The trees bear fruits during October, November and December months in Telangana and Andhra Pradesh in India. Most vegetable stores would be selling them during these three months. I always came across these but never gave them a second look. Amla pickle is usually made at home or can also be bought at Indian grocery stores . I don’t prefer eating Amla pickle as it has a lot of oil and salt . I like Amla Candy and always keep a stock . But I was bored of eating the candy . One day at the Organic grocery store , that I visit regularly, I saw these fresh , round , light green Amla’s. I was tempted to buy . I wanted to make my own candy but was not confident about the recipe. I thought lemme try eating them raw. But a raw berry has a typical taste and not very appealing. It is soury – astringent with a sweet aftertaste . I picked a few in my hand and asked the store keeper ‘what can I do with these ?’ and she immediately answered ‘Usirikaya pulihora ‘ (Amla rice ) . I asked her for the recipe and she immediately recited the recipe. I was like wowww and felt so happy :)) . I usually make lemon, tamarind and mango rice but this was news to me… I was so excited that I tried it the next morning and it was yummilicious. Since then I have made this dish several times. I now buy these whenever I see them. I have seen these recently and learnt that they are brought from Tamil Nadu where they yield fruit during February/March. The Gooseberry tree is revered by Hindus. There was a time , long ago, when I found it silly that my mom was worshipping a branch of this tree during ‘vanabhojanaalu’ in the park adjacent to Gandipet lake. ‘Vanabhojanalu’ is a get together/community lunch held under the trees/park/forest along with some fun activities. It was much later that I learnt about the potency of this fruit and then realised why the tree is worshipped. During the month of Karthika (Telugu calendar) , people meet for Vanabhojanaalu. This is a popular event in Andhra Pradesh and Telangana. ‘Vana’ is forest and ‘Bhojanalu’ is lunch. Karthika usually occurs in the months of Oct-Nov . This tree begins to bear fruit during these months. Vanabhojanalu is associated with this tree , when people form groups , cook and have lunch in a farm/nursery/forest where a Gooseberry tree is usually found. If there is no Gooseberry tree in the vicinity , a small branch of this tree is placed nearby and worshipped , followed by lunch.This is an event for get togethers along with some fun. The branches of this tree are sold in markets during Kaarthika month . Most of the customs and traditions of Hindus are in some way connected to health , hygiene , discipline and also have a philosophical touch . They are not superstitions as they are made out to be. The ignorant may not be able to appreciate the benefits of this fruit and hence these customs were incorporated. Here is the recipe for Amla Rice !! One cup raw rice . Boil the rice and keep it aside. Make sure it is not mushy. Spead the cooked rice in a wide pan so it cools and it would be easier to mix all the ingredients. Prepare Amla for the recipe by cutting them into pieces (throw away the seed) and grind it coarsely. Add oil in a pan . Add mustard, jeera and wait till they splutter. Add urad dal, chana dal , groundnuts and cashew nuts . Add the slit green chillies, curry leaves and Amla paste and stir for a minute. Add the above mixture to the boiled rice and mix all the ingredients slowly and thoroughly..Add the salt too. Add lemon juice at the end and stir well. Amla Rice is ready to be served !! I started googling for other Amla recipes and found recipes for chutneys , sweet , rasam and juices. Everyone should incorporate Amla in their diet , in whatever form they prefer , for a healthier body. Thank you Mother Nature !! Categories: Cooking, Health, Recipes, veggies | Tags: Amla, Amla rice, Indian Gooseberry, pulihora, recipe, rice, usirikaaya | Permalink. Rice is a staple food of a majority of South Indians. Most of us cannot imagine life without rice . Craving for rice begins after 24 hours of not eating rice:)) . I too belong to South India 🙂 and a major part of my diet used to comprise of rice. Rice is an ingredient in our Breakfast, lunch and dinner. The kind of rice that is usually available in most stores is highly polished and hence deprived of nutrients and is left with carbs. After learning about how cancer cells feed on sugars and carbs , I started my research on ways to minimize consumption of rice . Rice is an ingredient in several traditional South Indian dishes like Dosa , Idli , pongal , pulihora etc. Plain rice is eaten with other ‘curries’. I came across ‘millets’ a couple of years ago and gradually started incorporating these in my diet. 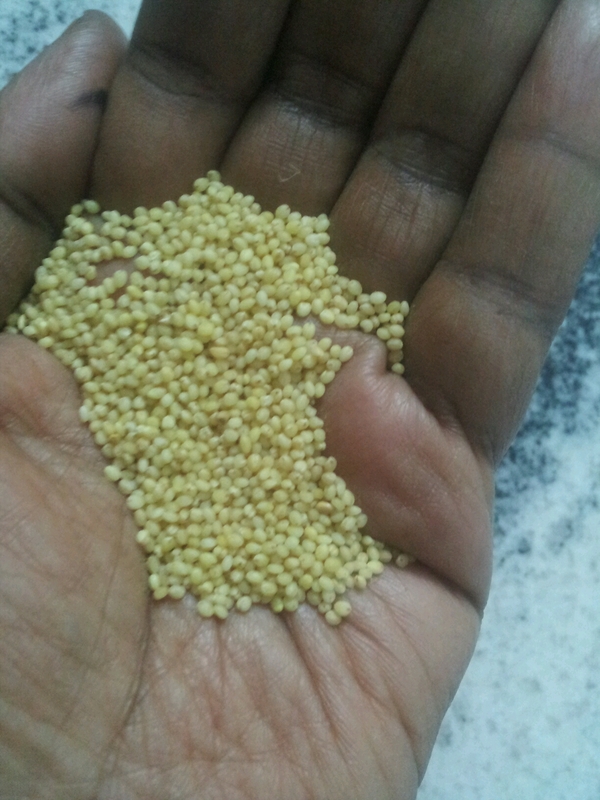 I will be focussing on Foxtail Millets in this post. They are called ‘Korralu’ in Telugu. These are a very close substitute to rice and can be used in the preparation of a variety of traditional South Indian dishes. Korralu (whole grain) can be cooked just the way we cook rice. Replace rice with korralu , for rice preparations like Pulihora, Kichdi, Sweet pongal etc. Batter for idli and dosa is prepared by substituting rice with foxtail millets. Brown rice, foxtail millets and Urad Dal can be added in equal proportions to make a batter for Idli and dosa. Korralu ravva is also available in a few supermarkets and organic stores. Idli and Upma can be made using this ravva. 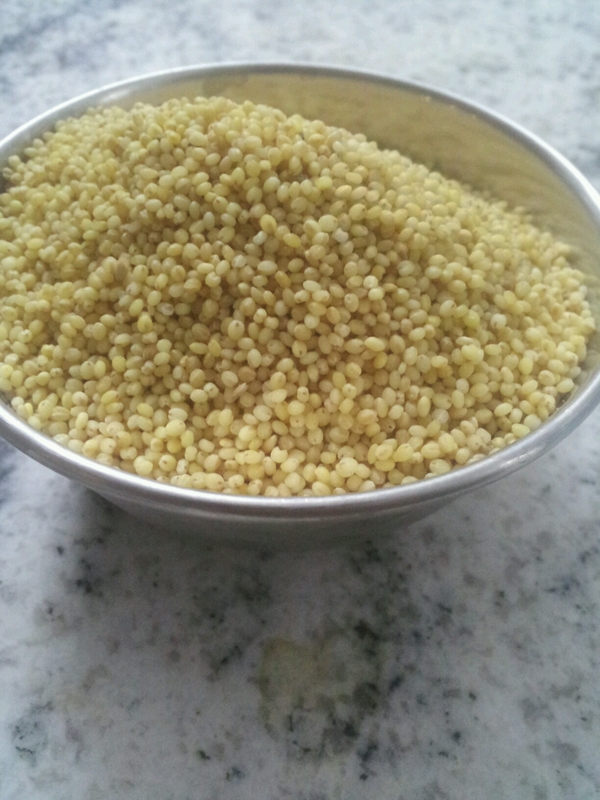 Add cooked Foxtail millets to your favourite salad . You can include foxtail millets in moong dal dosa. Get creative and adventurous !! Lots of recipes are available on youtube. Check them out ! Categories: Health, Organic food, Recipes | Tags: dosa, foxtail millets, Health, Idli, korralu, nutrition, pulihora, recipes, South india, traditional food | Permalink.